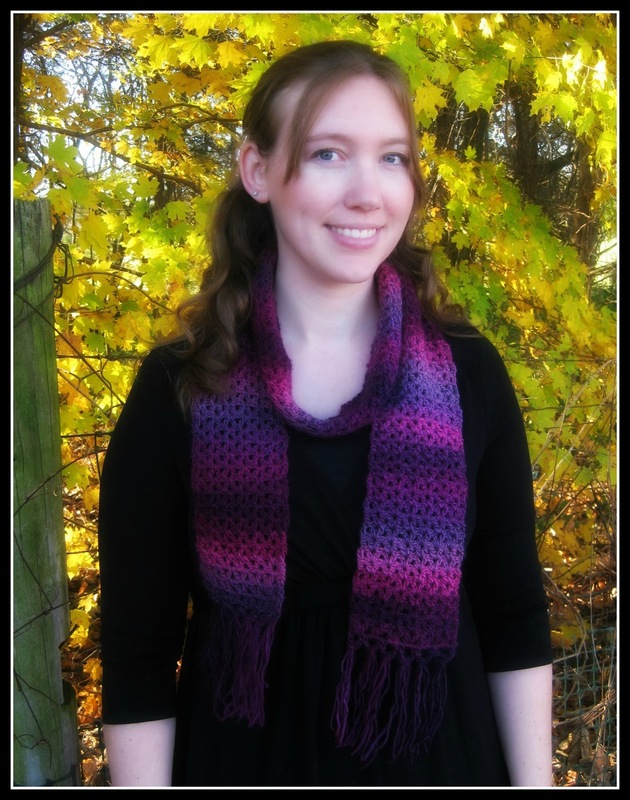 Unforgettable One-Skein Scarf - Free Crochet Pattern - love. life. yarn. I created this scarf as a quick project to wear with my black dress and new tall boots. I wanted something I could crochet super fast and that was very easy. 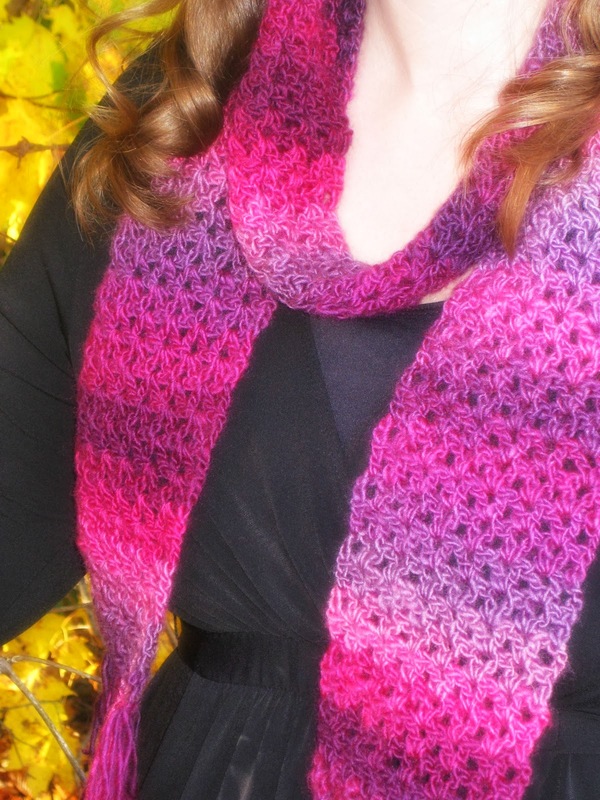 The Red Heart Boutique Unforgettable yarn is absolutely beautiful and turned this simple scarf into something special. Perfect for the fall weather we are having here – as evidenced by the beautiful trees in our backyard. ch. Repeat from * to last 2 ch, sk 1 ch, dc in last ch; turn. Repeat row 1 until piece measures 64 inches from beginning. top of turning ch. Fasten off. Join yarn at edge of beginning edge and repeat edging. Add three strands of fringe to each ch-5 sp at each end. I just discovered this yarn, it is so beautiful, but did not know what to do with it except that I wanted a scarf. I found your pattern on a Google search and just love it! Thank you! I just completed a wonderful little neck warmer using one skein of Unforgettable in… autumn colors, I forget it's name. 🙂 I crocheted it in crocodile stitch- let me tell you, this yarn's color pattern is perfect for crocodile crochet! Haven't crocheted in decades, decided to try this. I'm using Sensations Rainbow Boucle (had in my drawer). It is looking awesome and very smooth to use. I love this simple zen pattern! Thanks. So glad it's working out well! Thank you Amanda for the scarf Pattern, worked up beautiful. Made my scarf out of Echo never would have expected it to look so pretty. So glad it worked out well! This is really one of my favorite yarns. Loved this quick and easy scarf pattern. Do you have a hat pattern to go with it? I don’t have a hat pattern yet – but that is a great idea! I am planning on making one now that you mentioned it. ? It’s so nice to find a simple yet stunning pattern that actually works up beautiful! Thanks for the free and wonderful pattern. Just curious what the stitch multiple is because I’d love to make a baby blanket or even a shawl ohhh how about a hooded scarf? scoodie, Snoodie lol ? I don’t like eithet word so I’ll say hooded scarf lol maybe use fun fur or eyelash yarn for the hood edging or trim? Ohhhh pretty! Thanks for the inspirations!! Hi, I’m new to crochet and I finally finished the scarf. It was fun to make, however I’m unsure how to do the edging though. Do you have a video on how to do it? I’m a visual learner so watching someone helps alot. Thanks! Hi Lisa! So glad you are starting a crochet journey. 🙂 I don’t have a video up yet for the edging. I’ll see what I can do to help you with that part. I figured out the edging…I enlarged the photos on ravelry and could see the stitches. I love this pattern! Thank you! I am confused with the edging because it says chain 5 sk dc Then chain 1, where should the 5 chain be attached too. Please clarify. Oh I’m so glad I got clarification on this is the comments. Is there a way to add the parentheses to the pattern just in case others find it an issue too? Sure! I’ll add them in to clarify.